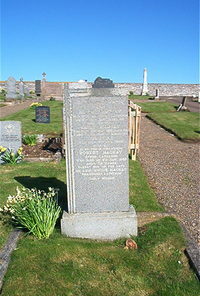 Robert Mackay died at Upper Latheron 6th May 1947 aged 88. Wife Janet Mackay died 2nd May 1912 aged 68. Daughter Christina Mackay died 18th December 1950 aged 67. Grandson Robert Mackay of Upper Latheron died 8th November 1982 aged 75 son of the late Mr and Mrs Angus Mackay of Beniechielt Latheron.